Radicci serves its pasta dishes in three sizes; as a side, single entree or family-style. Despite a Venetian gondola painting at the entrance and Italian music playing throughout, the new owners of Radicci Italian Bistro are low-key about their restaurant's Italian origin. "I'm only a little bit Italian," explains Danny Morey, who opened the restaurant in the former Daanen's Delicatessen location with wife Jennifer earlier this year. Radicci loosely translates to "little roots," adds Morey, who likes to focus on root vegetables in his cooking, such as the parsnips in the Radicci salad with arugula and piquant roasted tomatoes ($6.50/half, $9.50/whole) or the root vegetables in the Tuscan bean soup ($4/cup, $5.50/bowl). The Moreys relocated to North Idaho from Southern California, where Danny attended Le Cordon Bleu Culinary School, worked in a restaurant once featured on Food Network's Restaurant: Impossible, then signed on with national food distributor US Foods. 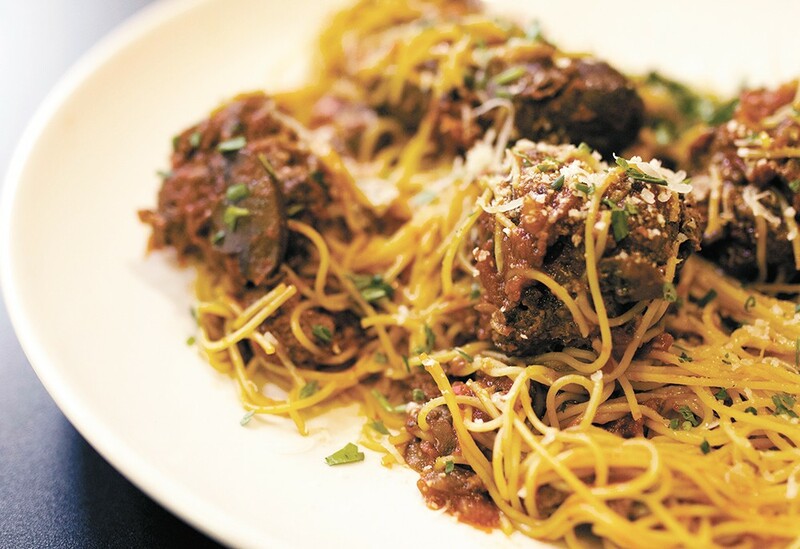 The couple wanted to be closer to Danny's mother, who keeps tabs on Morey's rendition of his great-grandmother's spaghetti sauce and meatballs, which Radicci serves three ways: as a side ($10), a single portion ($14) and family style ($23). Excluding Grandma's Spaghetti, all pasta dishes and entrees can be modified for gluten-free diners. Try the veggie-centric spaghetti squash pasta with sausage and mozzarella ($10/$14/$23), the popular roasted chicken in cream sauce with bacon and fennel ($15/$24) or herb-crusted salmon with parmesan risotto ($22). Radicci bases its pizza on a unique sourdough crust, baking it in a Marra Forni-brand Neapolitan brick pizza oven for the perfect char. Try a 10 or 16-inch pie with prosciutto and arugula, topped with artichokes and basil, or "arctic" style with cream sauce, roasted chicken, bacon, tomatoes and basil ($12/$17). The restaurant's sourdough is featured in the zeppole: fried dough coated in powdered sugar that this writer remembers fondly from New York City's annual Feast of San Gennaro. Radicci's version is chewier, drizzled with chocolate sauce and served with a smear of decadent mascarpone ($6.50). The original print version of this article was headlined "Taking Root"